PHOTO: A Club Deluxe Level will be added to the Breaker’s Cay Hotel. Grand Lucayan Beach & Golf Resort on Grand Bahama Island has gone through many reinventions and reshufflings over the past two decades. Indeed, it has been split into separate hotels and rejoined more than once as trends in branding and new marketing initiatives reshaped the resort. At the turn of the millennium, developers invested $500 million into the strip of beach that is now home to the Grand Lucayan resort, which includes the Breaker’s Keep complex and the 490-room Breaker’s Cay Hotel as well as its adjacent pool and beach. At that point the resort complex was named Our Lucaya, a reference to the Lucayan Taino Indian tribe that first settled the island. 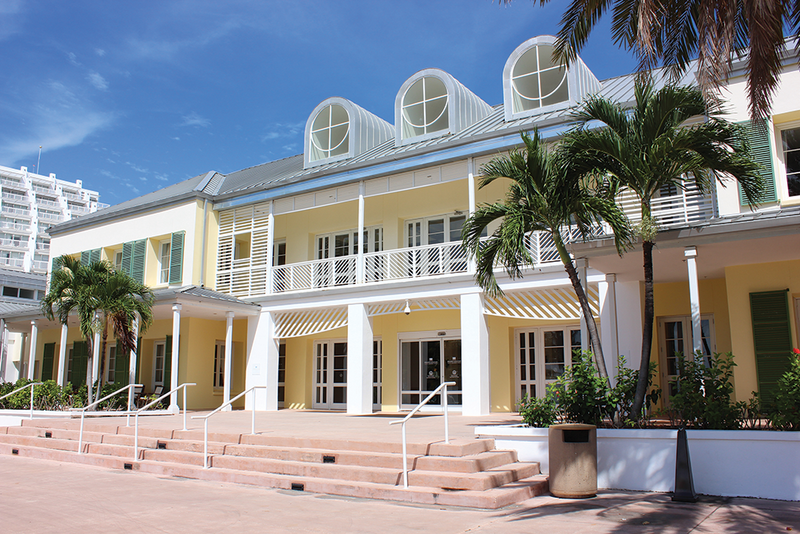 In 2009, the complex was rebranded once again as Our Lucaya, though in recent years it was renamed Grand Lucayan, a reference, Churchill says, to Grand Bahama’s marketing slogan for the resort and the Bahamian experience know as the “Grand Life.” The resort is now working to establish its brand once again as a destination for mid-range to luxury vacationers, even as more ultra-luxury resorts are being built on nearby islands. Today, the Grand Lucayan certainly is grand, with luxurious two-level and multiple-room arrangements with private ocean views, and there’s more to come a “Club Deluxe Level” with a penthouse suite is now under construction on the 10th floor of the Breaker’s Cay Hotel. The resort is not an all-inclusive, but it offers many packages for its guests, including unlimited golf, spa treatments, dining and room service items. 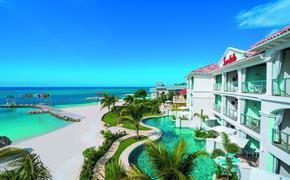 Here’s a look at the Grand Lucayan today. Accommodations: The resort’s guestrooms include 27 one- and two-bedroom suites, two presidential suites and 23 Ocean Front Lanai Suites. Every 400-square-foot guestroom features a flat-screen television, a king- or two queen-size bed(s), a dining nook with two-seat table, a coffeemaker and water bottles, free wireless Internet, a mini-fridge and a chaise with connecting ottoman. But the most spectacular feature of the rooms is the view, one of the reasons why many guests choose the Bahamas in the first place. Rooms above the sixth floor (the height of the many palm trees) offer a vista worth the additional price. They can choose an oceanview room overlooking the large beach and tropical landscaping with a multitude of palms and the winding pool, or a marina-view room overlooking the colorful dock and the resort’s four tennis courts. All terraces have two lounge chairs and a small table to enjoy a morning coffee or cocktail by the water. Rooms also feature sound-blocking glass doors to the terrace and two layers of curtains, including blackout curtains for late mornings and gauzy white curtains that give guests a view of the ocean. The air-conditioning in the units are built with sensors, so guests can let a breeze in from the terrace without wasting energy. Ocean View Suites, each measuring 800 square feet, include one bedroom, a dining room and lounge area with a sofa and chairs, a breakfast nook with a microwave and full refrigerator, and an expanded terrace with ocean views. These accommodations also include a changing area or powder room. Lanai Suites, at 900 square feet each, have two bedrooms, two bathrooms with separate powder rooms, roomy living areas with a kitchenette, and two full terraces set up with chaises for daily or nightly ocean views. Public Spaces: The Grand Lucayan is a resort that both couples and families can enjoy, with the outdoor pool featured prominently in the property’s center. Guests can lounge under the shade of palm trees or swim in the pools overlooking the beach. A shuffleboard court is set up on the lawn facing the grand Manor House, and a giant chess set and checkerboard sits in front of the hotel ready for young or old players to pick up a game. Guests can have a drink or snack by the pool at Hammerhead’s Beach bar or smoke a rare cigar at Havana Cay in Manor House, where a humidor keeps them fresh. Also at Manor House is Churchill’s, a fine-dining restaurant with a bar attached featuring live jazz in the evenings. The upper floor of Manor House has two large conference rooms; the Conference Center, which is adjacent to the infinity and lap pools and the fitness center, offers 16 conference rooms. Dining: Grand Lucayan offers a wide variety of cuisines from many regions and cultures, with three restaurants, a food court and the Asian-style China Grill attached to China Beach. Churchill’s, a Mediterranean-style restaurant with cuisine by Michelin-star chef Gianfranco Chiarini, is the resort’s fine-dining outlet with seafood, meat and pasta entrees priced from $15 to $40. The China Beach restaurant, open for dinner only, features Asian flavors from Vietnam, Thailand, Korea, Indonesia and Malaysia, with spectacular views of the ocean. Entrees are priced from $20 to $30. Guests dining in the early evening can watch the sun set over the water from a table in the corner. Iries Caribbean Seafood, open for lunch and dinner, has Jamaican and other Caribbean-inspired dishes, including a sumptuous dessert menu. Open for lunch and dinner. Willy Broadleaf, located under the main hotel building, is the spot for a full buffet breakfast with fresh fruits, pancakes, cereal, toast and omelets served until 10 a.m. On Sundays from 12 noon to 4 p.m, the restaurant offers a generous champagne brunch with food served from themed booths stretching across the wide dining room. The brunch is priced at $25 for adults and $12.50 for children ages 5-12. PHOTO: The upper floor of Manor House offers two large conference rooms. Pool & Spa: There are three pools to choose from at the Grand Lucayan: a winding “Serpentine” curls around Hammerhead’s near Manor House down to China Grill at the resort’s far end. Over by the spa and fitness center are the lap pool and the infinity pool, which sits above the ocean with an infinite view of the waves. Senses Spa offers a number of treatments, including aroma facials, full-body massages and body wraps, as well as the cleverly named “Bahamian Wrapsody,” which involves fresh-lime exfoliation and a wrap made from island ingredients like rum and island spice oil. The spa has eight treatment rooms, wood saunas, a steam room and a hydrotherapy tub. The fitness center is free for guests and hosts a wide array of classes, including yoga, pilates, spinning and the more intimidating “Body Blitz” and “Abs on Fire.” Guests also can use the dozens of exercise and weight machines available. Activities & Excursions: Grand Lucayan features four tennis courts of turf, grass and clay and an 18-hole, 120-acre 72-par golf course, designed by Robert Trent Jones Jr., which is accessible by free shuttle from the main resort. The resort does not offer its own watersports, but local operators peddle some on the beaches nearby. There are also beach activities for children, though the programming for older children is run by “Memories,” the resort next door. There is also the Treasure Bay Casino, open 24-hours, for those interested in slots and table games. Entertainment includes a nightly Junkanoo band with wild feathery costumes playing brassy tunes. On Thursday, Friday and Saturday evenings movies are played on a huge screen set up on the great lawn. Wednesday night is Fish Fry, a traditional night when Bahamians eat freshly caught snapper with rice or fried conch. The resort’s Fish Fry is priced at $25 for adults and $12.50 for children ages 5-12. There are a number of excursions available outside the resort, and the staff encourages guests to explore the island. Next door to the property is the Marketplace, a haven for restaurants, jewelry and local crafts. The front desk in the Manor House’s lobby also can order taxis to locations farther away. One place not to be missed is the Gold Rock Beach in the Lucayan National Park, a 30-minute drive away. These placid waters may look familiar because they serve as the backdrop for the “Pirates of the Caribbean” movie. Key Selling Points: The Grand Lucayan strives to offer something for everyone, from budget travelers to those who seek a comfortable, more inclusive experience. Service is excellent, with friendly and helpful staff who can accommodate most guests’ desires. Rates: Depending on the season and accommodations booked, rates range from as low as $90 to as high as $600 per night. Under an offer available through Dec. 19, 2014, guests who book three nights or more for a $99 per night rate get a $200 resort credit and a free round of golf. 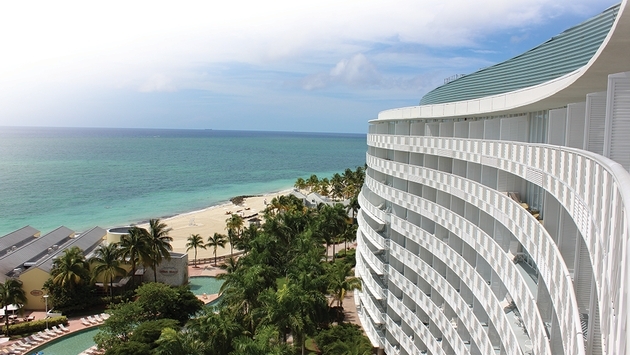 For more information, call 855-708-6671 or 242-373-1333 or visit www.grandlucayan.com.